Our modern, beautifully-appointed spa offers unparalleled pampering and revitalizing experiences. Our spacious, amenity-filled locker rooms and the warm ambiance of our welcome lounge and spa suites create the perfect atmosphere to relax and unwind. Spa services include facials for all skin types and conditions, every type of massage therapy imaginable, as well as body scrubs and wraps. Every service ends with our signature Peppermint Foot Massage that leaves your feet wrapped in peppermint oil infused hot towels, making us the ultimate destination for you to renew, refresh and revitalize. New! Walk-in appointments now available! Therapists on-site weekdays 9 am-7 pm, Friday’s to 4 pm during winter months, & Sundays, 9 am-5 pm. All services include complimentary use of our Seiden Wellness Center sauna and steam rooms. Babysitting available for members, call for details. For further information, please call the Spa directly at 201.821.8517 or 201.408.1480. The Spa at the JCC is open to the public. A non JCC member may use the Spa up to 3x/year; Public rates are offered at an additional $30 to the member rates listed below and include access to all facilities for the day. 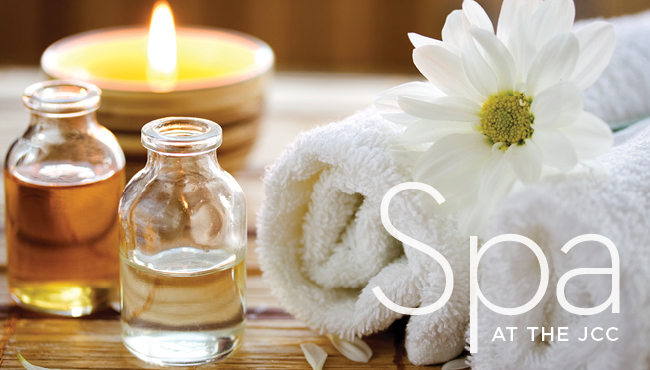 Click here for Spa at the JCC Etiquette & Policies. Plus, spend $50 on skin care products & get a free gift! Transport yourself to a place of peace and tranquility by experiencing any number of luxurious spa treatments to boost your health and well-being. Choose from facials, massages, body wraps, scrubs, and special packages. *Excludes waxing. Must purchase services Apr 7-14 to receive discount. call Spa directly at 201.821.8517 or 201.408.1480. The expiration date on Spa Specials will not be extended and may NOT be combined with any other offer. Spa services expire one year from date of purchase. The spa at JCC exclusively offers Repechage Skincare, Beauty from the Sea. Our therapists have had extensive training and we are committed to ongoing education for our staff; it is our mission to provide our guests the ultimate results for everyone’s unique needs. A series of treatments is recommended for best results. The perfect solution for combination skin. A thorough deep cleansing combined with our signature massage helps to hydrate and purify combination skin while soothing with St. Johns Wort, Green and White Teas. Skin will feel cleansed, toned, and moisturized. Our premiere facial treatment. Experience layer upon layer of pure, fresh European and American seaweed to help tone, deep cleanse, and firm the appearance of the skin dramatically. Enjoy a cool seaweed mask, followed by a mineral-rich thermal mask that allows for total relaxation and WOW results. Skin is cleaner and younger looking. Your ticket to a clean and glowing complexion. A soothing massage with our multivitamin C-Serum followed by a freshly mixed seaweed mask. This cooling and soothing treatment helps hydrate while improving the appearance of skin tone and clarity. Perfect as a standalone treatment or in conjunction with exfoliating treatments. Recommended for use to hydrate all skin types. Invigorating, toning, and overall improvement of mature skin. An Enzymatic Micropeel helps uncover a more even-toned complexion. Two massages and a cool Spirulina Seaweed Mask with Pentapeptide help to make skin appear firmer and smoother. The skin is then treated with Vita Cura Opti Lift Serum for visible tensing and lifting results. With Glyco-Sea Glycolic Peel. Based on a multi-dimensional approach to brighten and even the appearance of skin. Utilizing the latest in brightening ingredients and innovative marine bio-technology, this facial helps reduce the appearance of dark spots and hyper-pigmentation. An effective method in your quest to achieve results without damaging the delicate skin balance. With Argireline hexapeptide helps skin appear more luminescent. Codium Fragile seaweed helps to provide moisturization. Waterlily, Palmitoyl Proline, and Willowherb extracts help to smooth and sooth. Essential Fatty Acids of Sunflower, Sesame, and Almonds work to help moisturize the skin, while Bearberry helps to reduce the appearance of uneven skin tone for a brighter looking complexion. Begin with a thorough deep cleansing followed by gentle extractions. Then a healing mask is applied to help rehydrate dry or flaking skin and eliminate oily particles. Instantly soothing and cooling. Wonderful post chemical peels, microdermabrasion, and waxing. Combat the visible appearance of dark circles, puffi ness, and wrinkles. Peel and reveal with gentle glycolic and marine-based exfoliants to brighten complexion and remove dead skin cells. Pure papaya enzyme provides mild, vegetable-based exfoliation. Enhance the tone and texture of the skin. The ultimate add-on to any treatment; our therapists will slather your hands and feet with hydrating oils, sealing in the healing properties with moisturizing warm paraffi n to sooth and comfort and leave you with smooth beautiful skin. Helps to reduce the appearance of redness. Soft soothing sheet mask that combines Seaweed extracts with Hyaluronic Acid. Helps to control appearance of uneven skin tone. Sallow dull skin will look rejuvenated, glowing and restored. Instantly soothing and cooling. Rooibos, Green Tea, Aloe Vera, Licorice Root Extract, and Hyaluronic Acid all add to your youthful complexion. Reveal glowing skin. Soft and cooling. Combines the revitalizing benefi ts of Seaweed with renewing peptides to help reduce the appearance of wrinkles and drench and replenish the skin with moisture. Skin will look more luminous and uplifted. Our therapists, many of whom have been with us for years, are licensed and trained to understand the human anatomy and how best to provide relief from stress, sore muscles or simply allowing you to check out and relax. Before your massage a thorough medical history questionnaire is reviewed so that we can give you the best massage with confidence! Involves light, fast movement along the muscle surface. This technique improves circulation and promotes relaxation. Similar to Swedish, but more intense, this massage reaches much deeper into muscles and joints. Aromatherapy combines the emotional and physiological properties of gentle massage with the medicinal mood-enhancing properties of essential oil. We use a combination of techniques to help relieve chronic pain and muscle tension based upon everyone’s unique needs. Designed to aid athletic performance and help you maintain top physical form, pre and post activity, providing improved range of motion and muscle flexibility, boosts power and performance, and shortens recovery time. Recommended for athletes as part a regular maintenance program. Relieves tense muscles, sore joints, and stress through placement of heated stones on select chakra points. The stones deliver effective tissue and muscle massage at a pressure level that is comfortable for you. Shiatsu, an acupressure massage, is a powerful healing method that applies stretching and energy-based techniques to help release stored tension in your body. Reflexology is an effective, therapeutic foot massage first practiced by the ancient Egyptians and Chinese as a form of medicine. Every part of the body is connected to the soles of the feet by nerve pathways and energy channels. Through the process therapists can help you increase energy, improve circulation and create balance and harmony. Enjoy a romantic side-by-side full body massage complete with candles and rose petals. This pampering massage offers all the same benefits of regular massage, but is tailored specifically to the needs of pregnant women and their changing bodies. It will relax tense muscles, ease your sore spots, improve your circulation and mobility, and make you feel just great. Pressure techniques of various strengths used to move the waste fluids away from damaged areas of the body. Used post surgery to accelerate healing, reduce puffiness and scar tissue, and promotes the feeling of wellbeing. Call 201.408.1480 to create your own spa package. Mix and match spa services to create the right package just for you or a gift for a loved one. Luxuriate in a relaxing Swedish Massage combined with a special body scrub that gently exfoliates dry skin; finishes with a hydrating moisturizer. Tailored to the needs of pregnant women, this massage will relax tense muscles, ease your sore spots, improve your circulation and mobility, and make you feel just great; Pairs with a European facial and finishes with a replenishing mask. Begin with a choice of an exfoliating body scrub or an herbal body wrap; enjoy your aromatherapy body massage, deep tissue massage or reflexology; complete your experience with a gentleman’s facial. Enjoy being pampered with best friends. Begin with a complimentary steam or sauna, followed with a body scrub containing minerals and aromatic oils and a combination of three fabulous techniques: Swedish massage, Aromatherapy and a hot stone treatment. Complete with a European facial and replenishing mask. Perfect for a bridal shower, special birthday party, or just a great night out with the girls. Join us and get all the facts about this painless treatment and reap the benefits of a time-honored practice, right here at the J. Credentialed professionals from the Graf Center for Integrative Medicine at Englewood Hospital and Medical Center will safely introduce you to this healing procedure. Acupuncture is used as an aid to improve sleep, digestion, stress reduction, and pain relief, naturally. For details, call the Seiden Wellness Center Desk at 201.408.1441. Choose safe and hygienic waxing to remove unwanted hair in all areas. We use the best professional wax available, heated to perfection, and gently apply the lightest application to leave your skin feeling fresh and clean. Buy 10 of any one waxing/hair removal service and get one free!